Sudden weight loss in a senior needs to be addressed as soon as possible. Losing weight quickly can signify a serious medical disorder, so the sooner it’s recognized and addressed, the more likely your aging parent is to have a favorable outcome. Here are steps you can take if your loved one loses weight suddenly. As soon as you notice your loved one is suddenly losing weight, have a discussion about diminished appetite, worries, inability to prepare meals, or having no interest in going grocery shopping. You may discover the weight loss is related to loneliness, chronic pain, or fear of driving to the store to get groceries. After having the conversation, you should be better prepared to help your parent with the problems he or she has revealed. Once the stated issues have been recognized, you can then take steps to ensure your parent takes an interest in eating again so weight loss stops. If any of your loved one’s issues are related to loneliness, pain, or anxiety, he or she may benefit from professional home care for a few hours a day or a few days a week. Not every senior has the same care needs, which means they don’t all need the same type of Dementia care. Montgomery families can rely on Home Care Assistance to provide individualized care plans to meet your elderly loved one’s unique care needs. Our holistic Balanced Care Method was designed to help seniors focus on healthy lifestyle habits such as eating nutritious foods, exercising regularly, and maintaining strong social ties, and our Cognitive Therapeutics Method offers mentally stimulating activities that can stave off cognitive decline and delay the onset of dementia. Another important step to take if your parent is suddenly losing weight is monitoring for unusual signs or symptoms, which may include weakness, shortness of breath, blood in stool, jaundice, fever, or abdominal pain. While these symptoms may simply indicate your loved one has a treatable infection, they may also signify the possibility of a liver or pancreatic disorder, intestinal blockage, or pulmonary condition. If you discover your loved one’s weight loss is the result of a disease or chronic health issue, he or she can continue to remain in the comfort of home with the help of a caregiver. Living with a serious health condition can make it challenging for seniors to age in place. However, they can maintain a higher quality of life with the help of professional live-in care. Montgomery seniors can benefit from assistance with meal prep, bathing, transportation to the doctor’s office, medication reminders, and much more. As people age, their appetites can diminish. For this reason, you should serve your parent’s favorite foods. 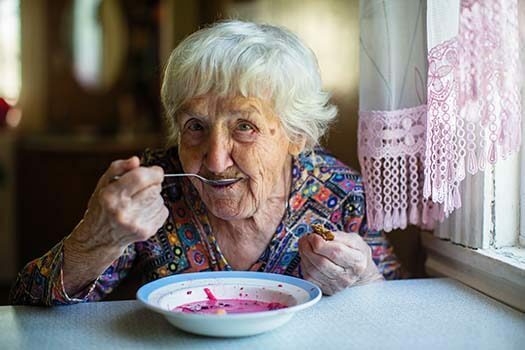 Older people sometimes get tired of cooking, and instead of preparing meals for themselves, they may rely on small snacks from the pantry, which results in weight loss and raises the risk for nutritional deficiencies. Prepare your parent’s favorite meals and store them in freezer containers so that when mealtime arrives, he or she can simply microwave the meal. When preparing your loved one’s meals, try spicing them up a little or flavoring them with citrus, parsley, basil, or other healthy herbs. Senses such as taste and smell can decrease as people age, so adding extra flavors to food may make your loved one’s meals more palatable and ensure he or she eats more and regains lost weight. If your parent continues to lose weight, make an appointment with his or her physician, who can perform a physical examination and order diagnostic tests as needed. If the medical tests fail to reveal the reason for the sudden weight loss, your loved one may be referred to a gastroenterologist (a physician who specializes in diagnosing and treating conditions of the gastrointestinal system) or a psychologist for further evaluation and treatment. No matter what is causing the weight loss, it may be a good time to look into hiring a professional caregiver to help your loved one stay as healthy as possible while aging in place. In Montgomery, home care agencies can be a great boon to seniors. With the help of the caregivers at Home Care Assistance, your aging loved one can lead a happier and healthier life. We offer a revolutionary program called the Balanced Care Method, which encourages seniors to eat nutritious foods, exercise and socialize regularly, and focus on other lifestyle factors that increase life expectancy. Trust your loved one’s care to the professionals at Home Care Assistance. Reach out to one of our compassionate Care Managers today at (334) 593-3988 to learn about the high quality of our in-home care services.